When it comes to something as precious and valuable as your diamond, it makes sense to obtain documentation of exact quality characteristics. 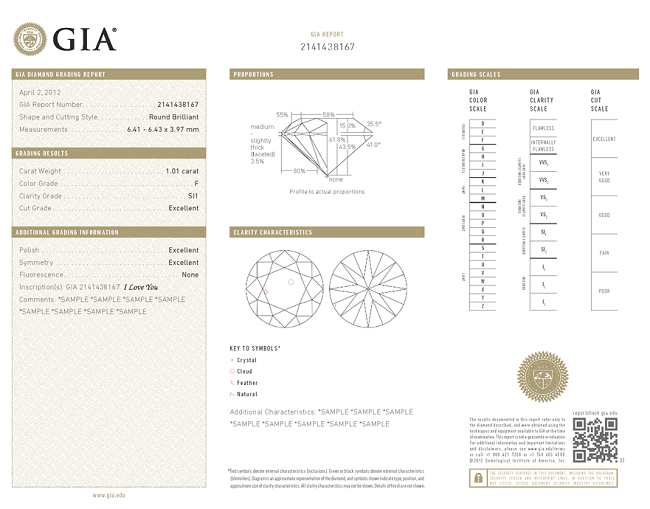 The Gemological Institute of America (GIA) Diamond Grading Report contains scientifically determined information on diamond Shape, Clarity, Color, Cut, Carat weight, proportions and finish. It also identifies any known treatments. It is also called a diamond dossier or diamond certificate. Most of our diamonds in store have been analyzed and graded by the GIA. It is important to note that a diamond grading report isn’t an appraisal. When shopping for a diamond, be sure to ask for a GIA Certificate so that you make a confident purchase. Sample diamond grading report only.